qaba one conditioner is enriched with certified organic ingredients to help restore moisture and strengthen hair. Formulated with certified organic grapeseed oil, certified organic rosehip oil an organic lavender water that nourishes, conditions and helps detangle hair. 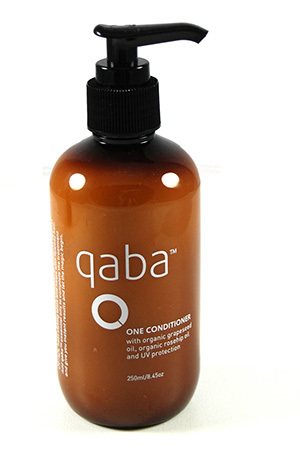 qaba one conditioner protects against uv rays, heat styling tools and helps with flyaway hair. Add qaba essential hair & scalp oils to complete the treatment and give you instant results. qaba one conditioner restores hair to its ideal state. Normal hair is polished. Fine hair is volumised. Dry hair is pampered. All hair types – fine, coloured, dry, course or children’s hair.